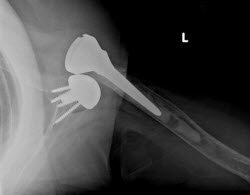 As use of the prosthesis for reverse total shoulder arthroplasty has expanded, a number of complications associated with the procedure have been recognized. In this article, the authors familiarize surgeons with the common complications. As use of the prosthesis has expanded, a number of complications associated with the procedure have been recognized. Our goal is to familiarize surgeons with the common complications. Hematoma formation is a widely recognized complication of reverse TSA: The dead space created is a factor in hematoma formation. Rates of hematoma formation have varied in the literature from 1-20%. [1,2,3] Meticulous hemostasis and placement of a drain are recommended to help prevent hematoma formation. If the surgical wound is benign appearing and completely dry, it can be managed with observation as it is resorbed. If there is excessive tension on the wound or persistent drainage, irrigation and debridement is recommended. Preoperatively, patients are given intravenous cefazolin, which is repeated for two doses postoperatively. They are also given a single dose of vancomycin just prior to surgery. The skin is prepped with chlorhexadine solution, which has been shown to lower the rate of skin colonization compared to iodine-based solutions. The chlorhexadine solution is used to prep the skin again, just prior to wound closure. If cultures are taken for a suspected infection, it is important to notify the lab that P. acnes is a suspected pathogen and cultures should be held a minimum of 10-14 days to ensure growth of the slow-growing organism. Acute infections are treated with irrigation and debridement with polyethylene exchange and retention of implants. Chronic infections are treated with two-stage revision. 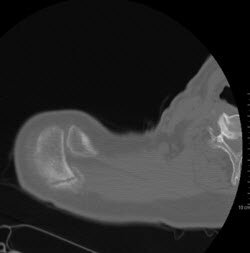 In a review of multiple studies, dislocation rates following reverse TSA were noted to average 4.7%. Dislocation is usually anterior and typically occurs in the position of adduction, extension, and internal rotation (Figures 1-2). Joint compressive forces have been shown to be the most important factor in stability,  and appropriate soft tissue tension is the most important factor in prevention of dislocation. In the early post-operative period, patients are advised to avoid activities that would put them into the position of risk, such as pushing off from a chair. 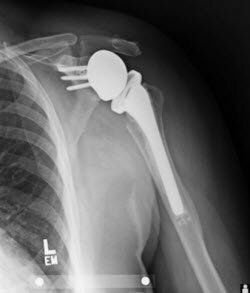 Prosthesis design appears to play a role in the importance of an intact subscapularis. The authors do not routinely repair the subscapularis during surgery. In the event of a dislocation, a closed reduction should be attempted followed by a brief period of immobilization and avoidance of the provocative position. 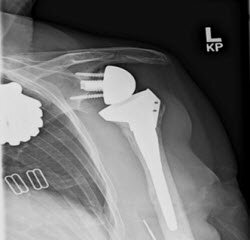 If closed reduction cannot be accomplished, dissociation of the humeral polyethylene insert should be suspected. The position of the implants should be closely assessed if surgery is required. Surgery often necessitates placing a thicker polyethylene insert or tray to further tension the soft tissue. Surgery may also need to include placing a larger glenosphere or changing the position of the implants. It is important to remove all soft tissue from the inferior glenoid to prevent any soft tissue impingement that can cause instability. Figure 1. AP image of dislocated reverse TSA. Figure 2. 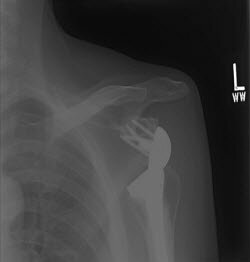 Axillary lateral image of dislocated reverse TSA. Inferior tilt of the glenosphere has not been shown to lower the incidence of notching,  but superior tilt should be avoided. Avulsion fractures of the anterior acromion (type I, Figure 5) appeared to have occurred during surgery. These were treated symptomatically, with symptoms resolving without further intervention. 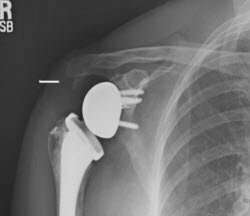 Fractures that occurred through the acromion just posterior to the acromioclavicular (AC) joint (type II, Figures 6a-b) presented with pain over the anterior acromion and AC joint at an average of 10.8 months postoperatively. 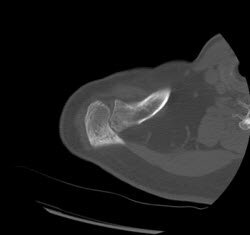 Plain films often do not show the fracture but do demonstrate AC arthrosis; CT scan can be helpful in fracture visualization. Patients with unstable fractures were treated with ORIF of the fracture, with resolution of symptoms. Patients with stable fractures were treated with distal clavicle excision alone with resolution of their pain. A displaced fracture at the base of the acromion (type III, Figure 7) was observed in the radiographs of four patients in the study. Type III fractures were treated with ORIF. 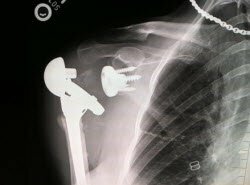 All these patients had screws placed through the superior aspect of the baseplate that exited at the junction of the acromion and scapular spine. This superior screw is felt to be a stress riser and is no longer routinely placed. 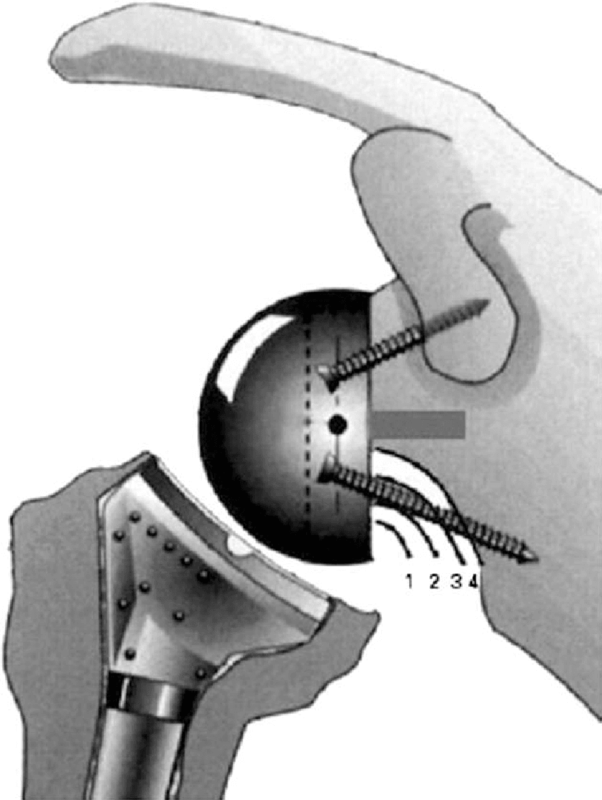 Glenosphere fixation to the baseplate varies between implants and is accomplished by either a morse taper or central locking screw. In systems that employ a central screw, the glenosphere may not be fully seated and the locking screw may cross-thread with the baseplate. If this occurs, dissociation is possible (Figure 8). Regardless of the system used, the glenosphere should be inspected on the post-operative x-ray to be sure it is flush with the baseplate. The reverse TSA is being performed in growing numbers in the United States. As the procedure has become more common, we have begun to recognize its complications. Even in the hands of experienced shoulder surgeons, there appears to be learning curve for the procedure; the number of complications goes down with experience. Familiarity with the complications of this procedure should assist surgeons in avoiding them as they become more familiar with successfully performing this surgery. Saltzman, Number GW, Bryzlo SM, Marecek GS, Koh JL. Efficacy of Surgical Preparation Solutions in Shoulder Surgery. J Bone Joint Surg Am. 2009 Aug;91(8):1949-53. Simovitch RW, Zumstein MA, Lohri E, Helmy N, Gerber C: Predictors of scapular notching in patients managed with the Delta III reverse total shoulder replacement. J Bone Joint Surg Am 2007; 89(3) 588-600.